So much of a seaweed called sargassum has been washing ashore around the world that it is hampering the tourism industry in places like the Caribbean and Mexico. Piles of the seaweed as high as 12 feet can wash in overnight forcing some resorts to close their doors. The mayor-elect of Solidaridad, Quintana Roo has said tourism in the region has declined by as much as 35% due to the obnoxious seaweed. Laura Beristain Navarrete of the newspaper Milenio described the sargassum situation as being of national importance. The giant piles of seaweed are paralyzing tourism, fishing, and other industries. "Environmentalists and the government are looking for alternatives," the mayor of Solidaridad said. The mayor-elect and her follow Morena senators are convening a special series of meetings to speak with scientists and officials to determine how to tackle the seaweed issue. The findings of the special meetings between officials and specialists will be presented to Mexico's new president-elect Andrés Manuel López Obrador. The goal of the meetings is to create a special government agency whose sole concern is addressing the influx of sargassum. One idea being considered is laying nets just offshore to stop the seaweed from reaching beaches. Boats would then collect the seaweed. Some resorts have already begun using tractors to haul the seaweed off the beach as it arrives. Larry Basham of Elite Island Resorts said, "The issue is that we never know what it's going to be like - we can have a week or two weeks where it's very clear and then all of a sudden overnight it washes in. We've spent an ungodly amount of money on tractors, heavy equipment, we've tried a number of different barrier systems on the water, none of which has worked well." An expert in fisheries biology and management at the University of the West Indies named Professor Hazel Oxenford said, "In 2011 it was the first time we'd seen it. It came as a complete shock and no-one had a clue what to do with it." The seaweed returned three years later and in far greater quantities. Antigua's environment minister said, "The same way we prepare for hurricanes, we have to prepare for sargassum." Barbados has also seen a massive influx of the seaweed. 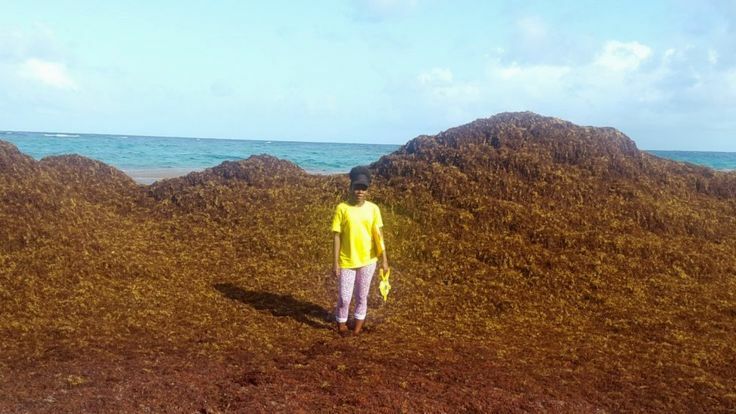 "You see meters high of sargassum piled up on shore but you're also seeing it in the ocean," Iris Monnereau, a Barbados-based fisheries expert said. Removing the sargassum is not only costly and time-consuming but it is hard on equipment. Monnereau added, "The sargassum tangles up their motors, their engines, their nets, their lines."